ENERGY STAR® certified fans provide better efficiency and comfort with less noise, and they feature high-performance motors and improved blade design, providing better performance and longer life. 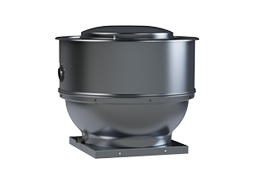 ENERGY STAR® certified ventilation fans use 70% less energy than standard models. What is CALGreen (Title 24 Part 11)? CALGreen (the California Green Building Standards Code) is Part 11 of Title 24. Title 24 is published by the California Building Standards Commission, and it applies to all building occupancies throughout the State of California. Title 24 applies to all building occupancies, and related features and equipment throughout the state, and contains requirements to the structural, mechanical, electrical, and plumbing systems, and requires measures for energy conservation, green design, construction and maintenance, fire and life safety, and accessibility. What does CALGreen require for Ventilation? 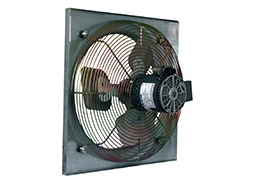 Fans shall be ENERGY STAR® compliant and be ducted to terminate outside the building. Unless functioning as a component of a whole house ventilation system, fans must be controlled by a humidity control. a)	Humidity controls shall be capable of manual or automatic adjustment between a relative humidity range of less than 50% to a maximum of 80%. b)	Humidity control may be a separate component to the exhaust fan and is not required to be integral or built-in. Note: For CALGreen a "bathroom" is a room which contains a bathtub, shower, or tub/shower combination. Fans are required in each bathroom. What does S&P recommend to meet CALGreen Standards? 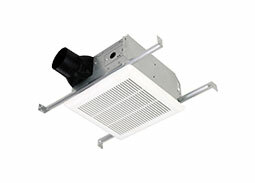 Remotely Mounted Fan Option: TD-MIXVENT or TD-SILENT with a wall/ceiling mounted humidity sensor. Single Family Homes: Meet all of the following criteria for local exhaust and outdoor air ventilation including the requirements of ASHRAE 62.2 – 2010, sections 4, 5 and 7 and Section 1504.4 of the 2009 International Residential Code (IRC). 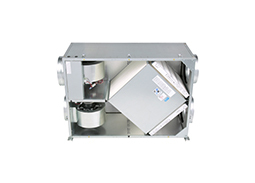 Multifamily Homes: Design and install a whole-unit ventilation system for each dwelling unit that complies with the requirements of ASHRAE Standard 62.2 – 2010 (with errata) or local equivalent, whichever is more stringent, and all local exhaust requirements for Single Family section, above. Install a balanced whole-house ventilation system (not just exhaust only or supply only) that meets the minimum ventilation requirements of ASHRAE Standard 62.2 – 2010, Sections 4 and 7, or local equivalent whichever is more stringent. Program the system such that it does not exceed the standard's requirements by more than 10%. 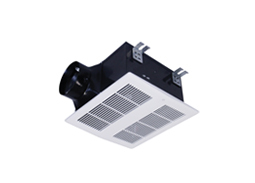 Install in the garage an exhaust fan that is rated at least 75 CFM (35 liters per second) and meets ENERGY STAR® CFM/W performance requirements. The fan must vent directly to the outdoors and have an automatic timer control linked to an occupant sensor, a light switch, a garage door opening-closing mechanism, a carbon monoxide sensor that turns on the fan when ambient CO levels reach 35 ppm or equivalent. The timer must be set to provide at least three air changes each time the fan is turned on. For a garage that accommodates more than three cars, follow the requirements in ASHRAE 62.1–2010. Exhaust the garage sufficiently to create negative pressure concerning adjacent spaces with the doors to the garage closed. Provide self-closing doors and deck-to-deck partitions or a hard lid ceiling. The pressure differential with the surrounding areas must be at least 5 Pascals (Pa) (0.02 inches of water gauge) when all doors are closed. The exhaust fan may either run continuously or on a carbon monoxide sensor that turns on the fan when ambient CO levels reach 35 PPM. 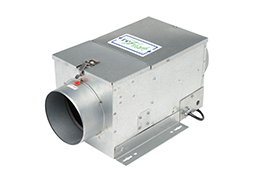 For a garage that accommodates one, two, or three cars, install an exhaust fan that meets ENERGY STAR minimum efficacy levels (CFM/W); direct-exhaust fans must be 100 CFM (47 liters per second) or higher, and ducted exhaust fans must be 130 CFM (61 liters per second) or higher. The fan must either run continuously or have an automatic timer control linked to an occupant sensor, a light switch, a garage door opening-closing mechanism, a carbon monoxide sensor that turns on the fan when ambient CO levels reach 35 ppm or equivalent. Any timer must be set to provide at least three air changes each time the fan is turned on. S&P's BEST Solution: PC fan with PCIAQS or PCD110XIAQS fan installed in Garage. 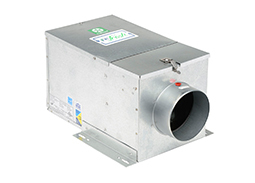 Continuous ventilation fans shall have a maximum sound rating of 0.7 sones. 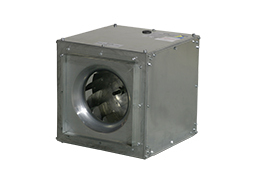 Intermittent fans shall have a maximum sound rating of 1.5 sones unless their maximum rated airflow exceeds 400 CFM. 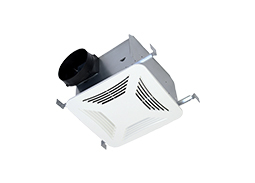 HVAC air handlers and remote-mounted fans are exempted if the fans are mounted outside the habitable spaces, bathrooms, and hallways and if there are at least 4 feet of ductwork between the fan and the intake grill. All exterior wall penetrations must be sealed with an acoustical sealant, and/or otherwise treated for sound control (e.g., lined elbows on vents, lined outer ducts where feasible). 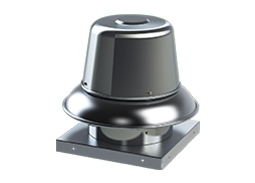 S&P's BEST Solution Option 1: TD-MIXVENT Fan as a continuous ventilation fan for whole-house ventilation. © 2017 S&P USA Ventilation Systems, LLC. All Rights Reserved.